This year I planted my pole beans in one old trough that Nolemana had drilled puka [holes] into. The original idea had been to put the trough on black plastic over Da Evil Knotweed. But after reading what would happen if we laid down the plastic, like ukutrillionbillion more evil knotweeds would emerge, I decided to ask Nolemana to put it up on the deck so I could plant the beans in it. He and Orvill did just that, and Nolemana built some ‘way cool da kines to rest the trough on so that it could be easily moved. 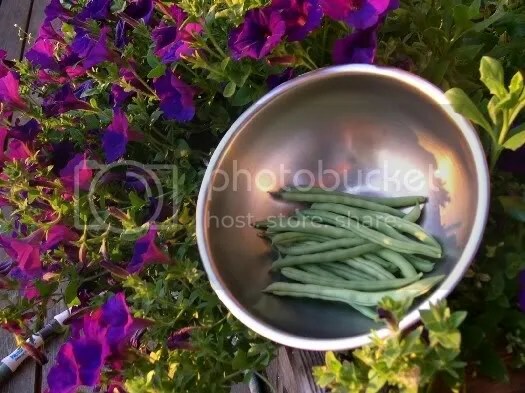 So I planted my beans, and they’ve been growing really well; however, I think next year I’ll put flowers in the trough cuz it’s not quite deep enough for the beans. They take a lot of water! However, today we harvested our first beans! And get plenny more to come! Awwww……. sorry to hea dat. Next yea going be betta! Beans, beans the more you eat… the healthier you get! I’m convinced that I’ll do my deck gardening next season! You’re so motivating! Go for it, Kikue!! I know you can do it. Plenny sun, plenny watah, plenny veggie food. Den reap and eat! Oh Wow! You got some good beans out of your plants.